Fair Trade Coffee: What Does It Mean? The phrase ‘fair trade’ is thrown about quite a bit. When we use the phrase in talking about coffee, we are referring to coffee that is certified as having been produced under fair trade standards. In coffee-growing regions, smaller family farmers in the area are often secluded, without access to cash or credit. In the past, these growers were forced to accept whatever was offered for their harvest (usually a fraction of the coffee’s worth). Organizations moved into these regions to work within the coffee production chain, to implement and ensure certified processes are followed. Growers partner with the packers, importers and distributors, adhering to specific rules in the production process. Fair trade also puts restrictions on child labor and pesticide use, while guaranteeing farmers a minimum price for their coffee. As a result, farmers can earn better incomes while improving their lives and their land. There is still much more to be accomplished in the fair trade arena. We at www.EnjoyBetterCoffee.com support what these organizations are doing today and are proud to sell coffee with these certifications. International Coffee Day is tomorrow, September 29th. More than 15 countries around the world will celebrate coffee — the enjoyment of coffee — on Tuesday. The celebration has been held since the mid-1980’s, though its specific beginnings are not known. On one level, the day is about coffee and loving it (a normal day for us, btw). But on a deeper level, International Coffee Day is about raising awareness of fair trade coffee and the life of coffee farmers. When coffee prices crashed in the early 90’s, coffee farmers were devastated by the losses. Organizations such as the new World Fair Trade Organization responded to the crisis. Working with the farmers, the organizations’ support leads to farmers getting a fair price for their coffee and being able to pay workers more. Money is also invested in the community, including teaching sustainable farming practices, building schools and creating jobs. EnjoyBetterCoffee.com has products from Bristot, Dallmayr, Jacobs, Lavazza, Tchibo and Douwe Egberts, which are all companies that follow certified production guidelines from organizations such as UTZ Certified and the Rainforest Alliance. *Discount valid through 9/29/2015 on EnjoyBetterCoffee.com with no minimum order required. Not valid with case or special sale products. Anytime is a good time to discover – or rediscover – Holland. Autumn in the Netherlands seems to have a special energy, perhaps because the residents have returned from summer vacations, the weather is not quite as warm and the young ones are back in school. With the season comes a long list of cultural events and festivals, all bringing inhabitants and visitors together for fun and arts. One of the best ways to see Amsterdam in the fall is via an old tram line, the #2. 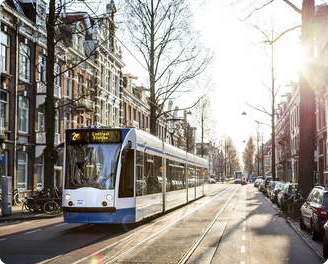 Our recommendation for the best of Amsterdam this fall is take the iconic tram system, line #2, for a ride. National Geographic has ruled that this tram ride is one of the best tram rides in the world! Why you ask? Well, for one, you can see and visit some of the greatest sites to be found in Amsterdam from this tram. Grab the #2 in an outlying area and a few stops in, you’ll arrive at a cultural center known as Museumplein. Here is the Van Gogh Museum, the Rijksmuseum and the Stedelijk Museum of Modern Art, all located within walking distance of each other. Stay (or jump back) on the tram, and the next stop takes you to Leidseplein. This square is a mecca for nightlife in the city. Two notable buildings, architecturally speaking, are found here: a 125-year-old theatre in neo-Renaissance style and home to the National Ballet and Opera, and the American Hotel with its distinct Art Nouveau style. Stay on the tram a few more stops and visit the Royal Palace. Further along, visit the famous floating flower market, where all the merchandise is on barges floating on the Singel canal. The tram line ends at the main railway station, Centraal Station. A tram ride only costs a few Euros, but get a day ticket for 7.50 Euros and hop on and off at your whim. *Discount valid from 9/20/2015 through 9/22/2015 on www.EnjoyBetterCoffee.com with no minimum order. This discount cannot be used with any other coupons or discounts. Not valid for discounted, special sale or case sale Douwe Egberts and Senseo items. Purchase our 2 pack of Douwe Egberts Aroma Rood Donker and receive an additional package for FREE! Free package of Aroma Rood Donker will be automatically added at checkout. No limits. No coupon code needed. NOTE: Order must be placed by 11:59 p.m. EDT Thursday, September 17th, 2015 on EnjoyBetterCoffee.com to qualify. Not redeemable for cash. Offer good while supplies last. Eiskaffee means “ice-cream coffee” and this recipe will deliver a creamy iced coffee in a snap. Of course, any of our coffees make delicious coffee – iced or hot! But use one of our great German brands of coffee for a true eiskaffee experience. Tchibo Instant coffee and Jacobs Instant coffee are two of the most popular brands on our site and in Germany and get you that much closer to a quick drink. Tchibo and Jacobs also make full-flavored ground and whole bean coffee if that’s how you roll. 1. Make the coffee. Allow to cool to room temperature, then chill in fridge. 2. Into a tall glass, place 2 scoops of vanilla ice cream. 3. Pour the cooled coffee into the tall glass, leaving a little room below the rim. 4. Top with whipped cream and sprinkle with chocolate or brittle (or both for true decadence). Enjoy. You’ll find a Caffé Freddo in most coffee bars in Italy. This drink is made of straight espresso that’s been stored in a freezer and is served as a coffee slush. Pour espresso over a scoop of vanilla gelato or ice cream and you have an Affogato, perfect for dessert. We have a wide range of Italian espresso, including Bristot, Caffe Vergnano, Illy and Lavazza. Germans, Americans and the French certainly drink a lot of coffee. These 3 countries are responsible for almost 65 percent of the total coffee consumed in the entire world. Germany doesn’t grow coffee beans, but some of the finest and established roasters are based in Germany. Sure, Frederick the Great banned coffee in Germany in 1777 (he thought his subjects were spending too much money on it), recommending beer instead. It turns out that his citizens loved the cafes and the conversation too much for Frederick to stop that custom. In Germany, when you have the coffee and the family or friends with which to chat, you need one last vital element: cake. Known as a Kaffee and Kuchen Klatsch (chatting with coffee and cake), this late afternoon break has many Germans visiting friends or cafes to drink, eat and enjoy. Nowadays, this occasion is observed less regularly, but still happen on holidays, birthdays and Sundays. BTW, that last one is really a cake. It is made from batter applied in layers onto a tapered cylindrical rotating spit and baked on an open fire. When sliced, the rings resemble tree rings, thus the name. *Discount valid on Jacobs, Dallmayr, Tchibo and Eduscho at www.EnjoyBetterCoffee.com through 9/15/2015 with no minimum order required. Not valid with case or special sale products. Please join in our celebration of the resilient and enduring American workforce! NOTE: Offer valid September 6th, 2015 through September 8th, 2015 on EnjoyBetterCoffee.com and EnjoyBetterTea.com. Order must equal $30 minimum after any applied discount; shipping not included. Not valid with any other coupons or discounts. Not valid for discounted, special sale or case sale items.